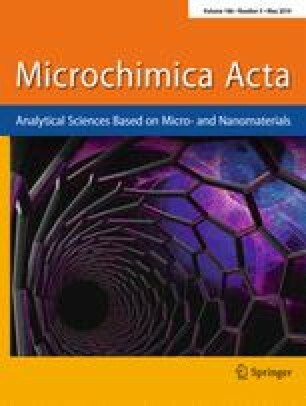 A ratiometric fluorescent nanoprobe is described for the detection of H2O2. 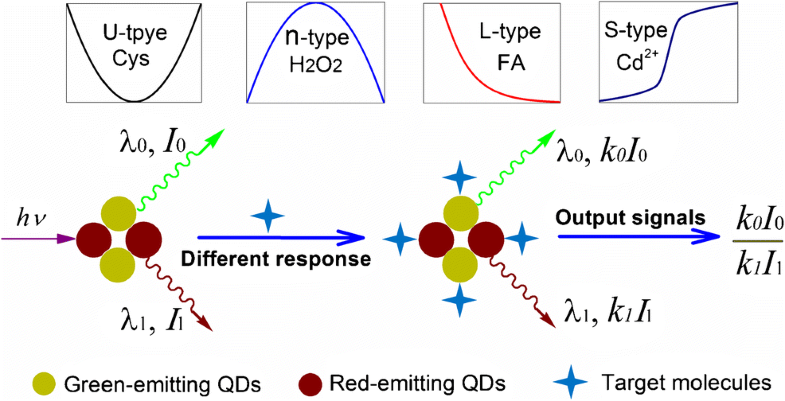 It is based on the use of a mixture of green-emitting CdTe quantum dots (GQDs) and red-emitting CdTe QDs (RQDs). The two kinds of QDs have different size and different fluorescence response towards H2O2. The ratio of the emission intensities at 606 and 510 nm (under 365 nm photoexcitation) can be used as the analytical information. Even without any chemical modification of the surface of the QDs, the probe display high sensitivity and selectivity for H2O2. The fluorescence of small QDs is more effectively quenched by H2O2. Stern-Volmer analysis showed both static and dynamic quenching to occur. The probe works well in the 10~125 μM H2O2 concentration range and has a 0.3 μM detection limit (3σ/slope). Schematic presentation of the ratiometric fluorescent nanoprobe composed of green-emitting and red-emitting CdTe QDs. λ, I, and k are the emission wavelength, emission intensity, and quenching/enhancement coefficient, respectively. The subscript 0 and 1 present the green-emitting and red-emitting CdTe QDs, respectively. The online version of this article ( https://doi.org/10.1007/s00604-019-3390-0) contains supplementary material, which is available to authorized users. This work was supported by the National Natural Science Foundation of China (Grant No. 21476183).